News: the colorful camera EYE-02 s GSM in to your self-phone. The manufacturer is Jablocom s.r.o., the dealer is Jablotron a.s. The camera EYE-02 is an inspired innovation. It’s fully compatible with wireless parts of the security alarm OASIS, it can be use both outside and inside. It secures areas by a screen detection, it saves every alarm situation and sends them to the JabloTool (toll free service) web through the GSM network. It also can take a picture of an area and send it to a user as MMS if required. It is security alarm, which can visually prove a presence of a burglar or any other danger in your secure area. It recognizes the real alarm from fake one, it can speed up an appropriate action undertaken by the police against a burglar, who can they easily monitor for the whole time. EYE-02 can cooperate with a lot of other detectors from alarm system OASIS. EYE-02 is an great alarm with GSM for a reasonable price 7.150 CZK without DPH, we offer delivery with installation and demonstration of right setting and controlling. A complete solution with right combination of detectors offers a great protection against many dangers. The camera can also serves as a compact video server. Many people can be robbed at work, e.g. stolen documents, wallets at the office. It causes a suspicion and a bad working environment. In many cases these unfortunate cases remain unsolved or it is solved late. 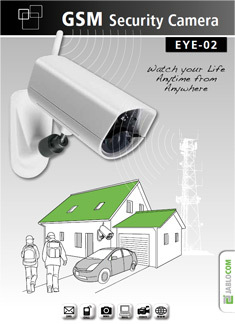 The camera EYE-02 can provide 24/7 record of an area without an alarm sound. The record is possible to replay anytime without any additional cost in your computer. A setting of the SIM card of an user for alarms reports - an active internet connection (EDGE/GPRS) with active MMS. The camera EYE-02 can be connected to a central security system. Registrated users of EYE-02 will get free access to central security system provided by JABLOCOM, which provides save storing of records. EYE-02 matches these norms ETSI EN 300220,EN 55022, EN 50134‐2,EN50130‐4,EN60950‐1.